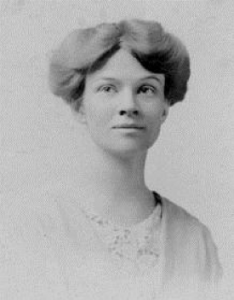 Katharine Houghton Hepburn, mother of actress Katharine Hepburn, was an ardent suffragist and head of the Connecticut Woman’s Suffrage Association. Katharine Houghton Hepburn was a part of the 1913 delegation that traveled to Washington, D.C., to meet with President Woodrow Wilson about the question of suffrage. Inspired by the arrests of her fellow activists, Katharine Houghton Hepburn joined the National Woman’s Party. Her actress daughter recalled that, as a child, she accompanied her mother to suffragist demonstrations. The elder Hepburn was scheduled to speak to the ACA convention in 1914 on the subject of “commercialized vice” (such as prostitution) but quickly dropped the subject and used the time instead to speak about the women’s suffrage movement.